November | 2009 | Chat n Craft - What? Beeton’s Book of Needlework was originally published in Great Britain in 1870 by Ward, Lock and Tyler. Instructions below as per the original. 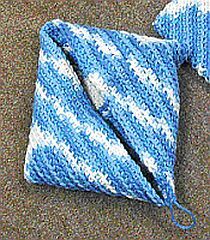 For modern tatters, oval means ring and purl means picot. This strip of insertion is worked with two cottons. Work with the cotton in the left hand over that in the right hand. Both ends of cotton are fastened together at the beginning by a knot. First work one half of the insertion the long way in the following manner:–1 plain, 1 purl, 1 plain (the purl must be very short); turn the purl downwards, 6 double, 1 purl, * 6 double, 1 purl, 1 plain, which must all be turned upwards; then turn the work so that the upper edge is turned downwards; work 6 double, fastened on to the last purl turned downwards (the fastening of the stitches is made with the thread in the right hand); a loop turned upwards is thus formed; turn the work downwards, draw the cotton in right hand underneath that in left hand, and work 6 double, 1 purl, 6 double, all turned upwards; fasten these stitches on 1st purl turned  downwards. 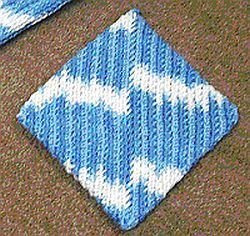 In this pattern 1st of border pattern is thus completed; turn it downwards, 8 double, 1 purl, 8 double, 1 purl, 1 plain, turn work downwards, 6 double, fastened on last purl of last pattern, turned up. Repeat from *. 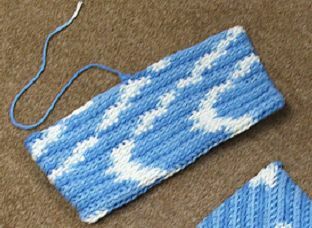 When the insertion is of sufficient length, work the other half in same manner, and fasten it on the 1st half by means of purl stitches between the 8 double stitches twice repeated. Let us know if you try this one and how it worked out. 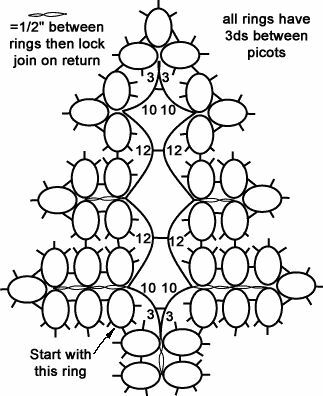 A lovely Christmas Tree pattern suitable for beginners, with pine-tree like picot needles. A perfect ornament for the holidays! Rings, Picots and Chains is all it is. I prefer to make useful items, so I’m really pleased with this little tree. 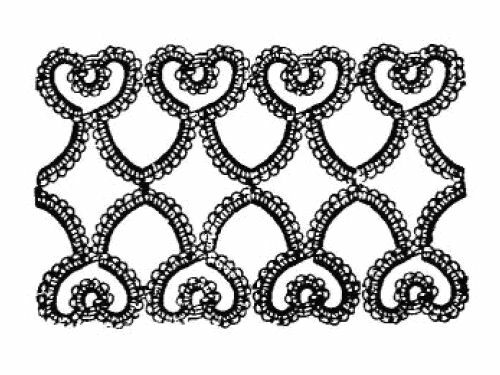 You can use it as an ornament for your tree, a decoration for a gift, an embellishment on clothing or Christmas quilts, or you can thread ribbon through it to make it into a bookmark. Add beads to it to make it sparkle, too. I purposely made the branches so they looked thick and “fluffy”. I tried at first to join more picots or to add a few less so you could see each individual one, but it just didn’t have the right effect. 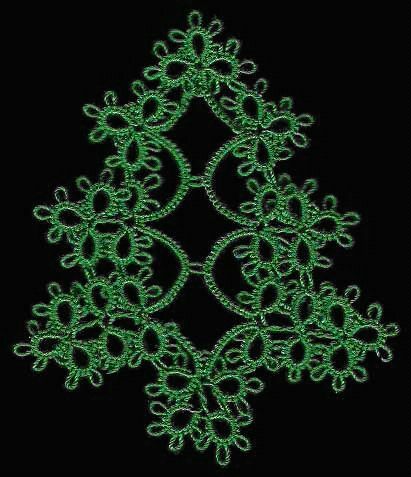 Pine trees have needles going every which way, so I thought the tatting should look similar. 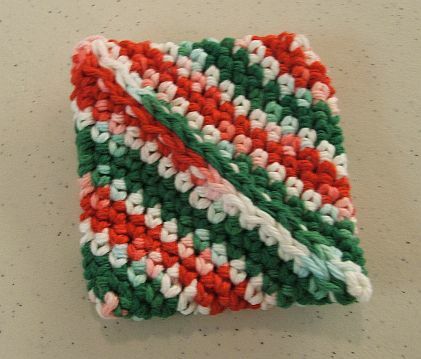 This pattern is beginner level and uses one shuttle (or needle). Copyright 2007 by Nancy Tracy, All Rights Reserved. 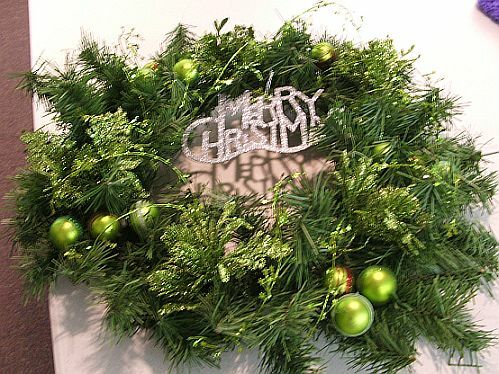 We decided to meet on December 14th instead of our normal 3rd Monday because it is Christmas week. We are going to do what we did last December. If you have some crafty stuff that you no longer want to complete, yarn you don’t want to use up, etc. Bring it with you and we will do a “trade or exchange”. We’re calling it White Elephant. Only bring a few items because we will have to be in the small meeting room and there will not be a lot of room to do this. Otherwise, bring whatever project you are working on and we’ll have fun seeing what everyone is doing and listening to all the wonderful stories. Would you like to see what the 2010 itinerary is going to be, barring any closed for snow days? 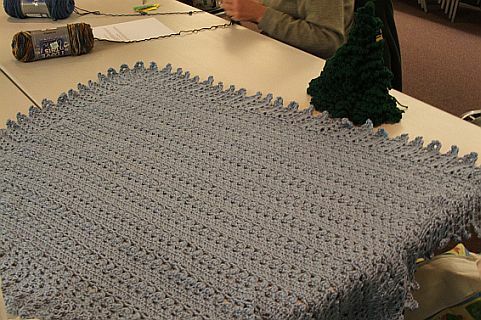 December – Bring your own project. 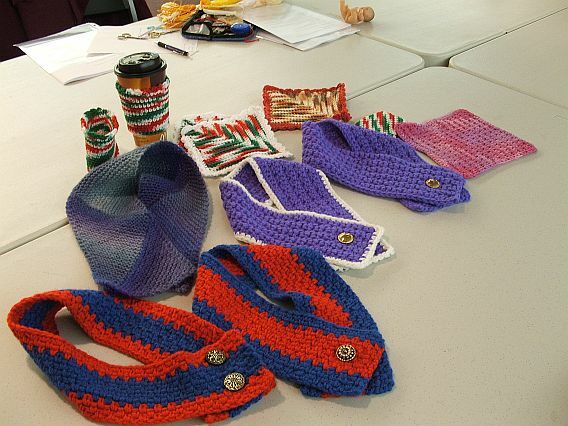 There will be a separate post with the details of the supplies you will need for the classes. Look for that in upcoming months. We’ve had several requests for this pattern. My Mom gave me the pattern that she made from an antique hot pad that was found in a church basement. She took it apart to see how it was made. It’s double thick. SC (single crochet) in 2nd chain and all the way around chain with 3 SC at bottom of chain. Working on back loop, SC 15 rounds. Stop on side and slip yarn through. Leave 12 inch tail. Turn to right side and fold into square. Whipstitch edge together with tail.